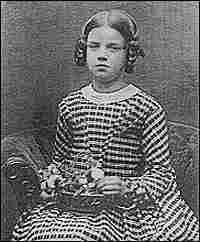 Death Of Child May Have Influenced Darwin's Work Charles Darwin was honest with his devout Christian wife that his scientific investigations led him to doubt the existence of heaven. But he feared that publishing his scientific ideas would hurt her deeply. Only after his daughter Annie's death did this change, biographers say. 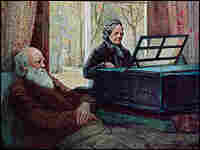 Darwin's wife, Emma, was a devout Christian and he struggled with what his scientific theories would mean for her. Most biographers agree that Charles Darwin came up with his big idea about the evolution of species when he was a fairly young man, a touch under 30. And yet, he didn't publish his theory for another 21 years. This leaves many wondering why he waited — and for so long. There are many possible reasons. Darwin was likely gathering more scientific evidence before braving a public audience. And biographers say that Darwin's family life also explains part of his reluctance to publish his revolutionary theory. Darwin's wife, Emma, was a devout Christian who was upset by her husband's lack of faith. 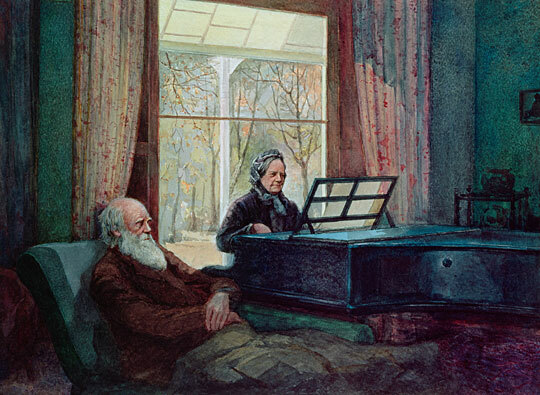 They experienced the loss of many of their children, but some biographers say that, in particular, facing the death of their oldest daughter, Annie, gave Darwin deeper insight into the nature of evolution and helped Emma come to terms with her husband's work. Darwin loved Emma very deeply, says Adam Gopnik, the author of Angels and Ages: A Short Book About Darwin, Lincoln, and Modern Life. In the beginning, he says, Darwin was worried about the effect that publishing his ideas would have on her. Gopnik says Darwin feared "it would hurt her, it would undermine her, it would pain her for him to publish these ideas." When Charles Darwin married Emma Wedgewood, she told him she wanted to love and be with him forever. And "forever," for Emma, meant beyond "till death do us part." In her day, people of her background and class believed in an afterlife, an eternity either in heaven (for those who had faith) or the "other place" (for those who did not). Emma knew her husband had doubts and worried that his scientific investigations would only deepen his doubts, therefore condemning her to an eternity alone. And she told him so, biographers say. So Darwin waited and worried and waited. Then the story took on an opera-like turn. The Darwins' beloved oldest daughter, Annie, got sick. And she died just after turning 10. Darwin was so overcome with grief that he could not go to her burial, biographers have written. But Annie's death changed things between Charles and Emma, says historian Deborah Heiligman. Darwin became more willing to proclaim his theories — and his religious doubts. And Emma, while still keeping her religious faith, turned toward Darwin, not away from him. "I almost feel like the death of Annie was so much the worst thing that could happen to them, and they survived it, that it was almost like anything else paled in comparison," says Heiligman. In November 1859, Darwin finally published his revolutionary book, On the Origin of Species. Biographer Lyanda Haupt says you can see the influence of Annie's death in his shaping of that book. "He knew so deeply and so personally and viscerally what death was now after Annie's loss," Haupt says. And, yet, in his writing "you see him affirming over and over this circle, the endless unfolding of life." In the last pages of On the Origin of Species, some say Darwin confronts the meaning of Annie's demise. Darwin takes his readers to a beautiful forest, rich with trees and birds singing everywhere, and reminds us of the beauty we see every day, in things like butterflies and flowers. And he demonstrates, especially, that humans, who can contemplate and love these things, are all products of millions of years of competition, struggle, famine and death — and that this struggle will continue. So, life will keep evolving new forms and new shapes. Darwin is stating what "we now call the existential dilemma," says Gopnik in his biography. He is saying there are two things that are true: One is that everything dies, and things die for no reason and to no apparent end. And their death is painful. And, that process of living and dying produces something amazing and beautiful and astonishing. And, Darwin himself writes, "There is grandeur in this view of life ... from so simple a beginning, endless forms most beautiful and most wonderful have been, and are being, evolved."